Tesla recently announced some hardware improvements to its Autopilot system, rendering the human factor in driving almost redundant. According to Carscoops, the cutting-edge company has released a video showing us what the system is capable of. For most tech geeks out there, this will be a dream come true for them as the video very clearly shows the electric vehicle driving itself completely unaided to work which in this case is a Tesla facility. Upon reaching the programmed destination, the Model X can be seen dropping its owner out at the lobby before it proceeds to find a empty parking lot on its own. It eventually parks itself with an expertly executed parallel park. 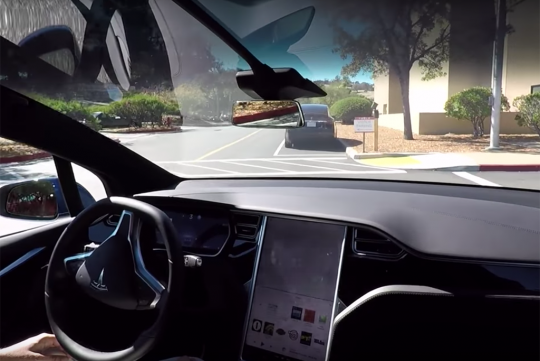 This enhanced autopilot system comes standard on all Tesla models and once the system is calibrated via real-world driving, owners will get to enjoy fully autonomous driving. When car is new still O.K.,but wnen the sensors are old or Dirty. ?Can it still do such a good job.? This is only a less than US$200,000 car with a sophisticated computer. Imagine Yahoo and many other MNC with multi-million dollar computer security systems with 24/7 on hand surveillance already had been hacked. Some more than once. Can't imagine what will happen if someone hacked the on board computer of the car?